Before the platinum records or the Super Bowl half-time show or the Rock and Roll Hall of Fame, Joe Perry was a boy growing up in small-town Massachusetts. He idolized Jacques Cousteau and built his own diving rig that he used to explore a local lake. He dreamed of becoming a marine biologist. But Perry’s neighbors had teenage sons, and those sons had electric guitars, and the noise he heard when they started playing would change his life. Rocks is an unusually searching memoir of a life that spans from the top of the world to the bottom of the barrel — several times. It is a study of endurance and brotherhood, with Perry providing remarkable candor about Tyler, as well as new insights into their powerful but troubled relationship. It is an insider’s portrait of the rock and roll family, featuring everyone from Jimmy Page to Alice Cooper, Bette Midler to Chuck Berry, John Belushi to Al Hirschfeld. It takes us behind the scenes at unbelievable moments such as Joe and Steven’s appearance in the movie of Sgt. Pepper’s Lonely Hearts Club Band (they act out the murders of Peter Frampton and the Bee Gees). This is an excellent memoir. After a somewhat shaky start in Johnny Depp’s introduction, Perry (with the help of David Ritz) gets on with telling his story. It’s quite the story, too: Perry takes us through his childhood in (upper-)middle class Massachusetts, his difficulties at school, his love for the outdoors, and eventual discovery of music and guitars. It’s a fascinating look into the life of a rock megaband, and one of the creative minds behind it. I really enjoyed this. 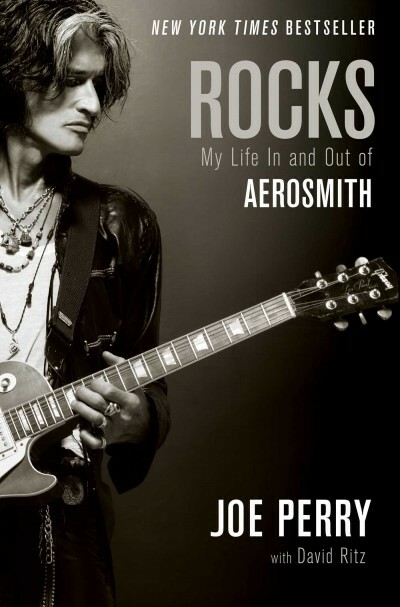 As Perry says, Rocks is “the loner’s story, the band’s story, the recovery story, the cult story, the love story, the success story, the failure story, the rebirth story, the re-destruction story, and the post-destructive rebirth story.” He details all of the ups and downs of Aerosmith’s long history — the slow, inexorable rise of the band, the changes in management (and the eventual catastrophes one of these brought), the early camaraderie, the slow collapse of band trust… It’s brilliantly written and the story is, frankly, engaging and gripping. Perry’s voice is inviting and conversational. Perry offers a detailed retelling of his life and experiences, both professional and personal (not to mention how the two sometimes collided). It’s amazing how many of the greats they met and played with. He is clear about his own failings and mistakes, especially regarding substance abuse. Thankfully, though, he doesn’t belabour the drink-and-drugs side of his past, taking a similar approach as Duff McKagan, rather than Anthony Kiedis. I thought Perry was also fair and balanced when it came to discussing the conflicts between him and other band members — especially the other half of the Toxic Twins, Steven Tyler. His affection for his bandmates is clear, but like any band of brothers, they have disagreements and fights. Tyler comes across as a tortured, insecure talent. [I’ll have to read his Does the Noise in My Head Bother You? memoir soon, to compare.] Perry avoids writing a gossipy book, though, which I think made this a much better story. For guitar nuts, the book also includes detailed information about his various instruments and this thoughts about them. If you have any interest in the evolution of rock music, then I would highly recommend this memoir. Easily one of the best memoirs I’ve read, I’d be amazed if it isn’t soon considered one of the classics of the genre. Rocks is published by Simon & Schuster, and is out now. S&S Canada very kindly provided a copy for review.